Nova Scotians can now see the names from the original Nominal Roll of the only Canadian battalion in the First World War composed of Black soldiers. The No. 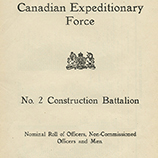 2 Construction Battalion, Canadian Expeditionary Force (CEF), was raised in Nova Scotia in response to petitions by Black men who wanted to serve their country but were turned away at recruiting offices. This year, 2016, marks the centenary of the battalion’s formation, which was authorized on July 5, 1916. To commemorate the centenary, and to honour the lives of the men who served in No. 2 Construction Battalion, the Nova Scotia Archives is pleased to present a digitized version of the Nominal Roll of Officers, Non-Commissioned Officers and Men ‘on strength’ as of 28 March 1917, the date of their departure overseas from Halifax, on board the SS Southland. The 13-page printed list presents significant biographical and family information about these enlisted men and officers; the transcription of the printed document into a companion database also enables quick surname and community searches within the Nominal Roll. The inclusion of each man’s Regimental Number expands biographical research possibilities to include exploration of the First World War Attestation Papers online within the Library and Archives Canada website. To complement the document, the Archives also digitized a photograph that was taken of the ‘A’ Company in the fall of 1916. The large, panoramic image features Commanding Officer, Captain Kenneth Allan Morrison, seated in front with an officer on each side, and surrounded by three rows of enlisted men, all in full uniform. By scanning the original photo at a high resolution and adding a zoom feature, the Archives has made it possible for online users to navigate the entire width of the image and zoom in to see each member of the battalion. The Nominal Roll is a sobering document. It invites reflection on the significance of the No. 2 Construction Battalion within Canadian military history, and on what it meant a century ago to serve as a Black Canadian soldier. February is African Heritage Month. To learn more, visit the African Nova Scotian Affairs website, which includes a calendar of events. Nova Scotians can also keep up-to-date on African Heritage Month by liking the African Nova Scotian Affairs’ Facebook page, and by following @OfficeofANSA on Twitter. The Nominal Roll invites reflection on the significance of the No. 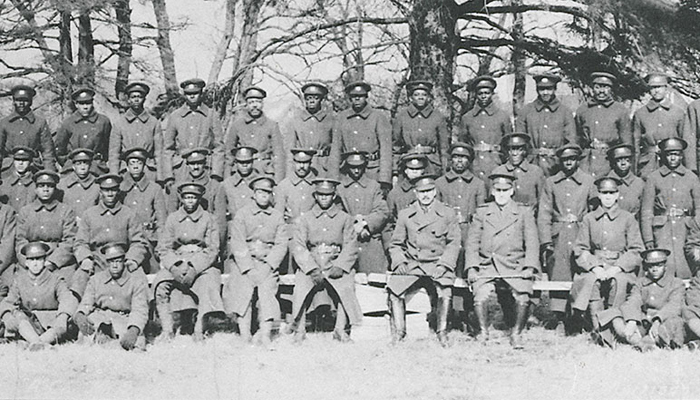 2 Construction Battalion and on what it meant a century ago to serve as a Black Canadian soldier.